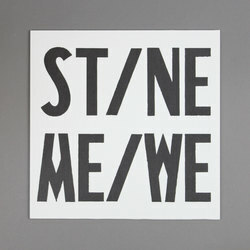 ST/NE - ME/WE. Vinyl EP. Bleep. You may know ST/NE better as the vocalist and sound artist Stine Janvin Motland. With this latest release for the embryonic Laura Lies In label Janvin Motland puts aside her manipulations of her own voice in order to work with third-party samples. Sources as wide-ranging as Muhammad Ali and testifiers in the #metoo movement have their voices repurposed here. When wedded to the noisy anti-trap of ‘Change The Winning Team’ or ‘Open Minded’s warping concrete the effect is powerfully disorientating. Think Holly Herndon and One Nation-era Hype Williams.